Portable power is nothing new and is definitely something needed given the number of devices we carry around these days. However, the majority of portable power packs cater to mobile devices and consist of the usual USB-A or USB-Type C outputs. 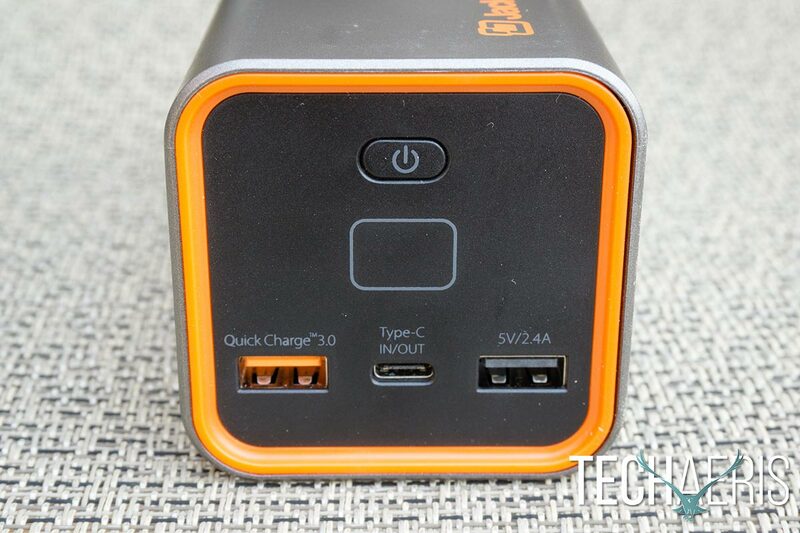 Our Jackery PowerBar review takes a look at a hefty portable power pack that not only allows you to charge via USB but also has an AC outlet for powering laptops and other devices as well. While most portable chargers are thin and flat, the Jackery PowerBar is quite a bit larger. Roughly 2.5″ high and wide and 6.5″ in length, the PowerBar’s shell is a silver plastic case with rounded edges. 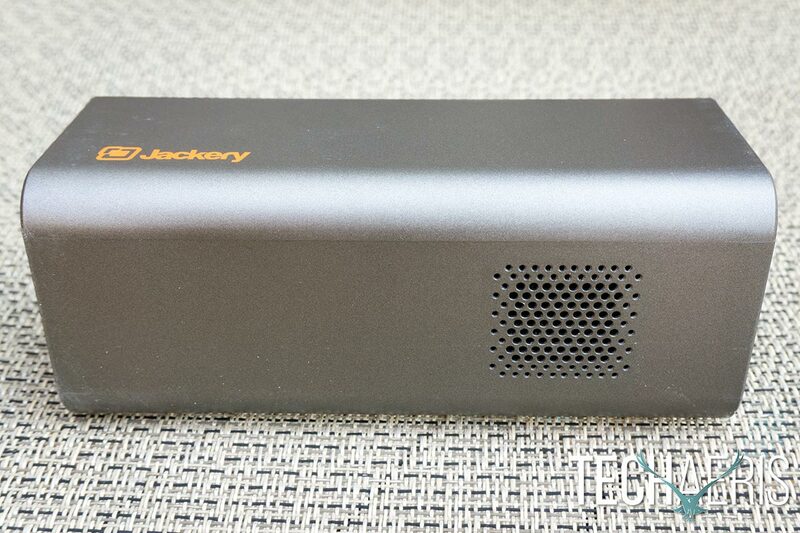 The Jackery logo is printed in orange on the top, which matches the orange accent around the front of the device. Near the back on each side are a series of ventilation holes which provide airflow for the internal fan when the PowerBar is turned on. The Jackery PowerBar has a nice rounded edge design. The front of the Jackery PowerBar is where you’ll find a power button, battery percentage display, USB QuickCharge 3.0 port, USB Type-C port, and a regular USB port. Around the back side is where you’ll find an LED power indicator light and the 110V/85W AC plug as well as regulatory and technical information. The AC plug will accommodate three-pronged plugs, but being a portable unit there is no ground. The front end of the Jackery PowerBar. The bottom of the PowerBar is smooth like the sides and top, and it definitely would have been nice to see some sort of rubber feet on the bottom to give it a bit of grip when used on a table and to provide some protection as well. The Jackery PowerBar is super simple to use. Simply plug your USB or other devices into the appropriate port, press and hold the power button for a couple seconds until you hear the fan turn on, and you’re off and charging. Jackery recommends that you plug the device into the PowerBar and then turn it on to help avoid any unwanted behaviour or outcomes. To turn off, hold the power button for a couple seconds and the unit will turn off. When the device is on or off, you can touch the power button to see what percentage of battery charge is remaining. As expected, the Jackery PowerBar does a great job of charging and running devices that fall into the parameters mentioned in the specs above. USB device charging, of course, is pretty much a no brainer with smartphones, tablets, and even Bluetooth speakers and headphones charging as expected. Using the AC outlet is a bit trickier though, as the PowerBar has an 85W output with a 100W maximum. 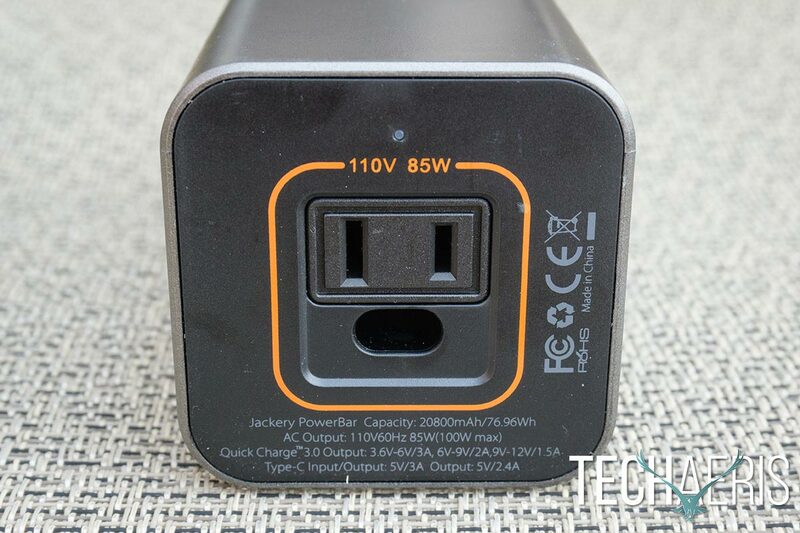 The Jackery PowerBar also powers and charges devices that utilize less than 100W. Fortunately, most devices have the required wattage stamped on it, at the least, it should have output amps and volts which you can multiply to determine the wattage used by the device. 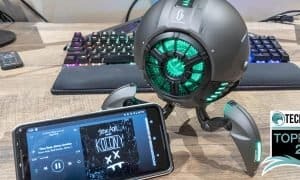 The Jackery PowerBar will run a number of devices, and in our testing, I was able to run everything from smaller laptops (65W output) to larger Bluetooth speakers (90W output). You will definitely run into issues with appliances like toasters and blenders, as well as laptops which require more power. 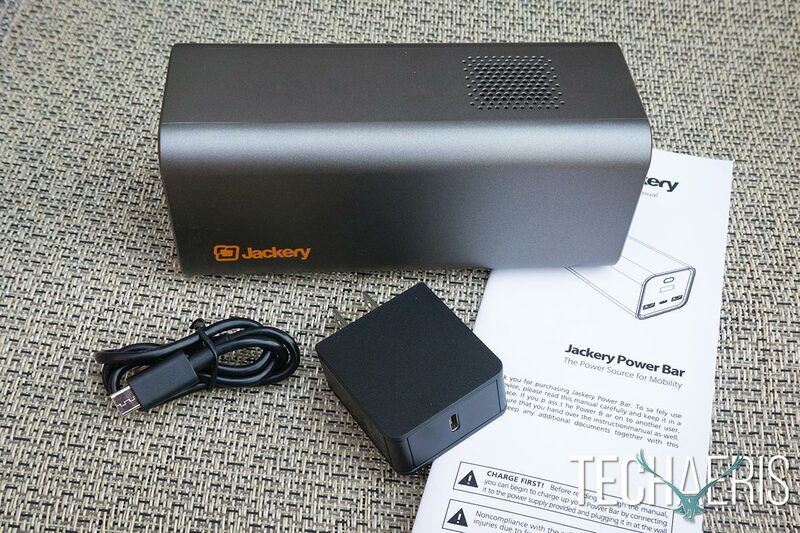 If you do try to use the Jackery PowerBar with a device or appliance that requires more than 100W, the unit will actually disable output and you’ll have to turn it back on to use it again. As mentioned above, the PowerBar does contain an internal fan and does stay cool even after extended use. The fan is definitely noticeable though, not overly loud but you can easily hear it from a few feet away. Another note to mention. It doesn’t appear that the PowerBar has an auto shut off if it isn’t being used. As a test, I left the unit turned on and had nothing plugged into it and after 15 minutes it was still running. During that time, however, the battery charge remaining only dropped 1% so it’s not a huge deal. Given the aforementioned fan noise though, you’ll definitely notice it’s running when not in use and will most likely turn it off anyway. 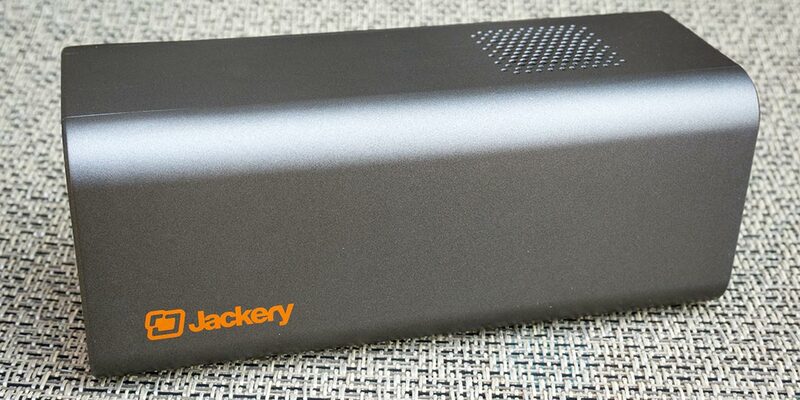 The Jackery PowerBar packs a 20800mAh battery for 77Wh of power. Battery life is, of course, going to be dependant on what you are using it for. According to the user manual, you can power an LED light for around 18hours, charge a smartphone 7-8 times, or charge a laptop 1.2 times before needing to recharge the PowerBar. Charging a BlackBerry KEYone used about 11% battery while using a 90W input Bluetooth speaker used about 16% of the battery for each hour of use. Using the PowerBar to run a laptop with a 65W power requirement used about 8% of the battery capacity when used over the course of an hour. The PowerBar takes about 7 hours to recharge, definitely something you’d want to let happen over night. If you’re short on outlets and want to power a laptop or wish to charge your smartphone from the PowerBar while it is charging, you can do so as well. The Jackery PowerBar has an MSRP of $199USD which, in my opinion, is a bit much for something like this. 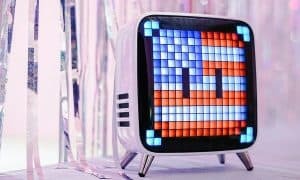 While it offers portable power for USB and AC devices, it is somewhat limited in what it can power. The good news is that, at the time of this review, there’s still a month left in the Indiegogo campaign meaning there are still plenty of cheaper perks available. 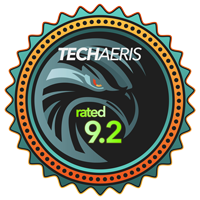 There are a few Super Early Bird perks left at $119, which is a great price. Once those are gone, the Early Bird Price jumps to $129, which is still pretty reasonable. After that, the Indiegogo special price is $149. 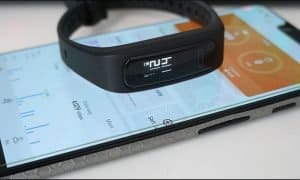 It is a flexible goal campaign, and product shipping is anticipated to be in November of this year. 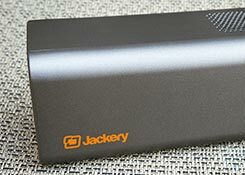 The Jackery PowerBar is a decent portable power source for USB and AC devices with lower power requirements. It can definitely be useful for those who frequently work on the road without access to AC power, but it is a bit on the expensive side at the full MSRP price. *We were sent a sample of the Jackery PowerBar for the purposes of this review.